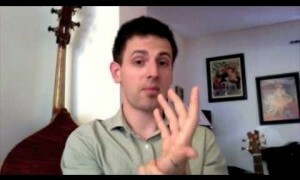 Neuromuscular Therapist and musician Todd Urban demonstrates the 4 basic motions of the wrist. Proper motion, pressure, relaxation and body use are discussed. Todd also discusses some of the improper techniques often used by musicians which can damage their wrists and hands. The four basic movements of the wrist are flexion, extension, radial deviation and ulnar deviation. Pronation and supination involve the forearm and take place at joints between the radius and the ulna. The stretch demonstrated involved over twisting the forearm and twisting the carpals. The most common wrist fracture is due to a fall on the outstretched hand, not due to stretching (even incorrectly) the forearm. Most musicians do not move in straight planes, but rather on an angle from a combination of flexion and ulnar deviation to extension and radial deviation or vice versa. The purpose of stretching is to increase muscle length, not to warm up the muscle. The golgi tendon organ ( alluded to in the discussion of holding the stretch) fires in response to a quick stretch, not a prolonged hold. A prolonged hold of 20-30″ (there does not appear to be agreement in the literature about the best optimum time, some cite 60″) is necessary to achieve lengthening of the muscle.. Stretching should occur after the muscles are warmed up and is really only necessary if greater range of motion in the muscle is required during playing. or after playing to relieve muscles that sustained a long hold or in other words, were contracted or shortened for a long period of time during playing. Stretching the hands or digits for 3 seconds, like suggested here, will cause muscles to contract and tighten up. One needs to stretch for more than 30 seconds to allow the GTO to loosen the muscles and cause elongation to take place. Moreover, longer time stretching helps reorganizing the fascia in the hands and arms.